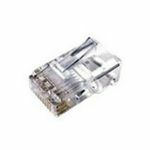 These Cables to Go 11380 modular RJ45 termination plugs are designed to work with both stranded and solid conductor wire and will accomodate oval and round cable both. 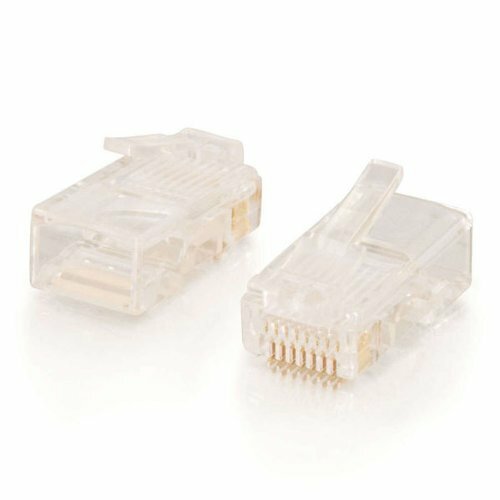 Use these plugs for data or voice data.From the popular 4x4 and 6x4 voice grade plugs and adapters, to the 8x8 and 10x10 data products, we have the solution for your cable terminations. Modular plugs are designed to terminate either stranded or solid conductor wire, and to accommodate either oval or round cable. 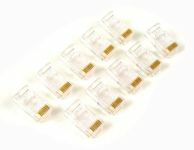 Manufactured with gold-plated contacts for reliable data transfers. Use for voice/data applications. From the popular 4x4 and 6x4 voice grade plugs and adapters, to the 8x8 and 10x10 data products, we have the solution for your cable terminations. Modular plugs are designed to terminate either stranded or solid conductor wire, and to accommodate either oval or round cable. Don't buy from pc small they ship it in a large box 3 pounds was the shipping weight. This resulted in excessive charges on my end. Otherwise the product is great. I am finding that 3 of 4 don't work reliably. I purchased a crimp tool from the same dealer so that should not be the cause. I am finding that the connection may or may not work and nothing is visible to indicate the problem. 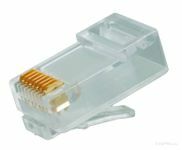 Plug the connector into the computer and then see if it works. If not then split it off and try again, and perhaps again. I make them fine with another tool and connectors so it is not user-error. 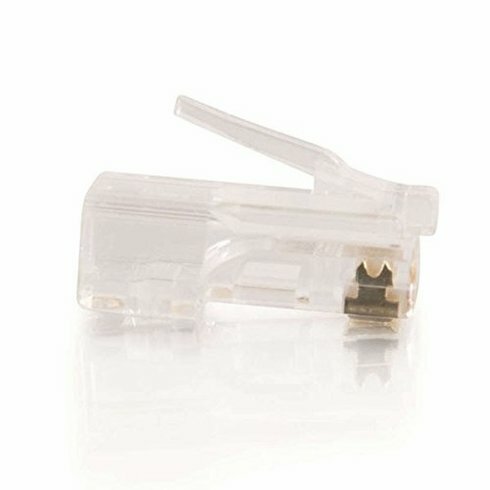 I just have not tried some other connectors with this tool yet to validate the problem with the connectors, but at this point i would not purchase these again. Hard to imagine what could go wrong with a modular connector such as this. And nothing did. The vendor shopcloseouts sent some generic brand instead of the listed cables to go brand. You can buy 100 generic plugs for half the price. I've used a little over a dozen of these so far, and though each one has successfully connected to each of the wires on both ends on the first try, the clips are too weak. 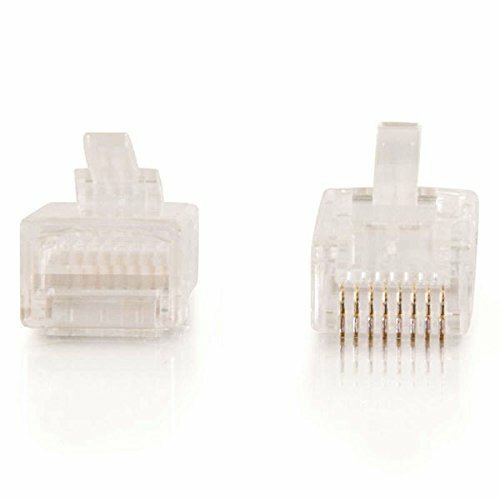 The clips don't hold the cable in the ethernet port, they would just slide out if if the cable was pulled even just a little. I had to use the relief boots instead to prop up the clip so that the cable would stay in the port. It's not the way it's supposed to work, but they are holding in place for now. 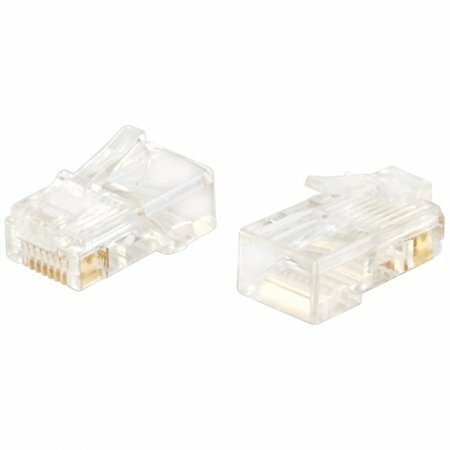 Not much to say they are your standard rj45 connectors for ppl who know how to crimp their own ethernet cabling. Should have given more weight to the reviews i read regarding these plugs. Just finished a small job installing a few access points in the ceiling and stopped using them after the first 8. I went to the computer room, plugged in the new cables we created to the switch, saw the link lights come on, then went to visually inspect the access points. 2 of them didn't show any lights. I walked backed to the server room, checked the switch and sure enough, 2 of the plugs popped out of the switch because the tabs on these plugs don't hold. They don't open far enough to &#34;snap&#34; in, so they just kinda sit there until they get pushed out from the force of the pins inside of the switch port. If you're a professional, stop don't use these, they'll make you look bad when they pop out of the switch or whatever device you have plugged in and you'll have to come back and reinstall new plugs that work.